Dwyn is “a mixed-up game of Welsh history for 2 to 6 players” designed by artists Simon Grennan and Christopher Sperandio [www.kartoonkings.com/] in 2006.. 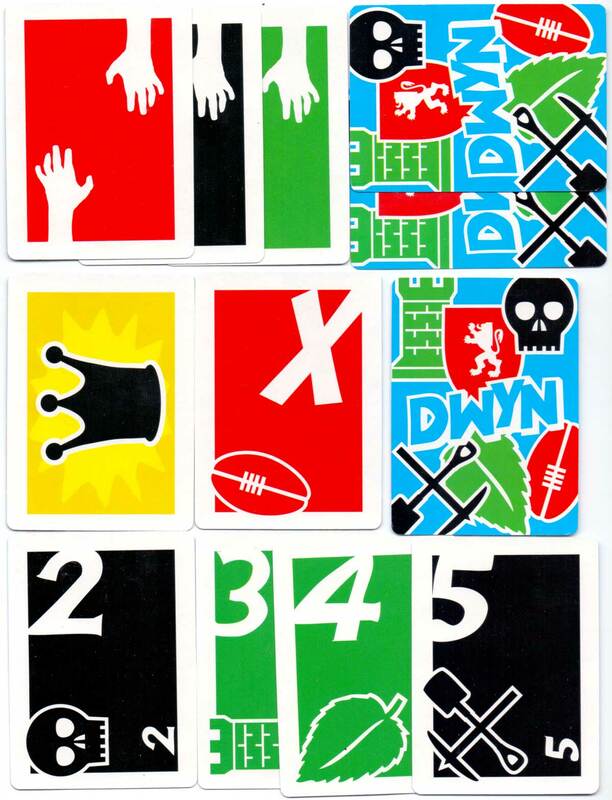 It is played with a custom six-suited poker deck divided into three colours, red, black and green, with figures drawn from Welsh history and popular culture. Characters include Owain Glyndwr, Captain Henry Morgan, Nest verch Rhys, a princess of Deheubarth, renowned for her beauty and Cerridwen, the Celtic goddess of inspiration. The six suits are: miner’s tools, shield, rugby, leaf, castle, skull. Each suit has a head, torso, feet card plus numbers X, 2, 3, 4 and 5. In addition the deck contains three “steal” cards (double hands), six doublesided wild Dwyn cards and the “krown” card. The aim of Dwyn (Welsh for steal or take) is to get rid of all cards in hand and to lay a complete body (head, torso + feet) along with the “krown” card on the table. Above: Dwyn - a card game about Welsh history designed by Simon Grennan and Christopher Sperandio, 2006. 60 cards in box. The creation of Dwyn was supported by Cywaith Cymru - Artworks Wales as part of May You Live In Interesting Times, Cardiff`s Festival of Creative Technology developed between Chapter and Bloc: Creative Technology Wales.